Please find the same error code, and try the solution to see if it will fix your issue. 5 [Your-user-ID] is used by another phone Live Search Contact us with your reason for switching device. 11 Live Search requires a Professional plan. Live Search Please upgrade to professional plan to use Live Search or change operating mode to “DB”. 14 Subscribe [your-user-ID] at http://www.asellertool.com/pricing.html (We refund the 1st month to new users) Live Search Follow this topic to start a subscription. NOTE: Only Standard or Professional subscriptions are eligible for 30 day trials. 15 You have not started trial local-DB scouting. DB Download Please either (1) follow this topic to start a subscription, or (2) register your MWS seller account here. 31 Subscribe [your-user-ID] to Standard or Professional plan in order to download DB. DB Download To download database, a Standard or Professional plan is required. Follow this topic to create or resume your subscription. 32 [Your-user-ID] is on Lite plan for LV search only. Upgrade to Standard or Professional plan to download DB DB Download To download the database, a Standard or Professional plan is required. Follow this topic to upgrade your subscription. 33 [Your-user-ID] has exceeded the limit of switching between devices. DB Download We have a limitation on how often you can switch devices. Please contact us with your reason for switching device and indicate whether you are using Google-Fi as the carrier on your phone. 34 [Your-user-ID] is used by another device recently.. DB Download We have a limitation on how often you can switch devices. See here. 35 In order to start trying for DB download for [your-user-ID], you need to either register MWS with AST or subscribe to Standard or Professional. DB Download Either (1) start a subscription (We refund your first payment in 7 days), or (2) register your MWS seller account here. 36 This Amazon Merchant had been used for trial. Subscribe [your-user-ID] to Standard or Professional. DB Download The Amazon Merchant account had been in use with two other AST accounts and thus is not eligible to be used for trial. In order to download database, follow this topic to create subscription. 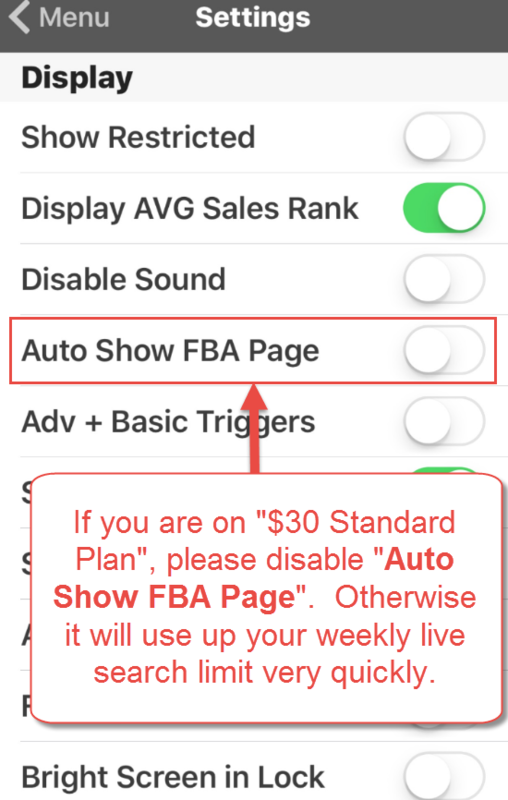 !Error Code 11 If you are on standard plan and scan a lot of non-media item, do not enable “Auto Show FBA Page”. Otherwise, you will use up your weekly live search limit very quickly and you will receive Error Code 11 weekly live search limit reached. This is because, for non-media items, you scan UPC barcode. But on Amazon’s side, it uses ASIN to identify and that ASIN is different from UPC code. Our app needs to do live search behind the scene to get the ASIN value for the non-media item, then go to Amazon site with that ASIN to show you the FBA page for this item.